Kiseido Digital Bookshelf puts English-language go classics from the masters at your digital fingertips! All you need is a computer with a DVD drive and Adobe Reader software. This is the indispensable addition to the go library of you or your loved one. 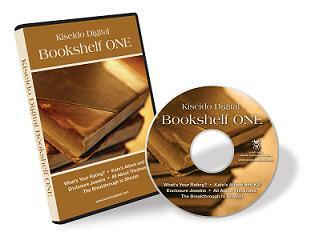 Kiseido Digital partners with CreateSpace for creating and shipping DVDs. What's Your Rating?, by Miyamoto Naoki: 50 full-board problems with detailed explanations. Kato's Attack and Kill, by Kato Masao. Fundamentals, problems, and game commentaries on Kato-style middle-game fighting. Enclosure Josekis, by Takemiya Masaki. Dictionary of josekis for attacking and defending corner enclosures, an oft-overlooked topic. All About Thickness, by Ishida Yoshio. An easy-to-understand, visual explanation of the crucial concept of thickness. The Breakthrough to Shodan, by Miyamoto Naoki. Commentaries on three- and four-stone handicap games for the low-kyu player.